Earlier this week we had torrential downpours and today it was in the mid-60s. A few weeks ago it was the tail end of winter. It’s supposed to be sunny and in the 70s this weekend. San Francisco weather for a glorious two months. Yay for spring! Cook pasta; drain, reserving 1 ladleful pasta cooking water. Stir pasta cooking water into ricotta, along with the extra-virgin olive oil. Melt butter in a skillet. Add leeks and sauté over medium heat until softened, about 2-3 minutes. Add kale and arugula. Cook, stirring frequently or until kale wilts, about 2 minutes. Check seasoning. Remove from heat. 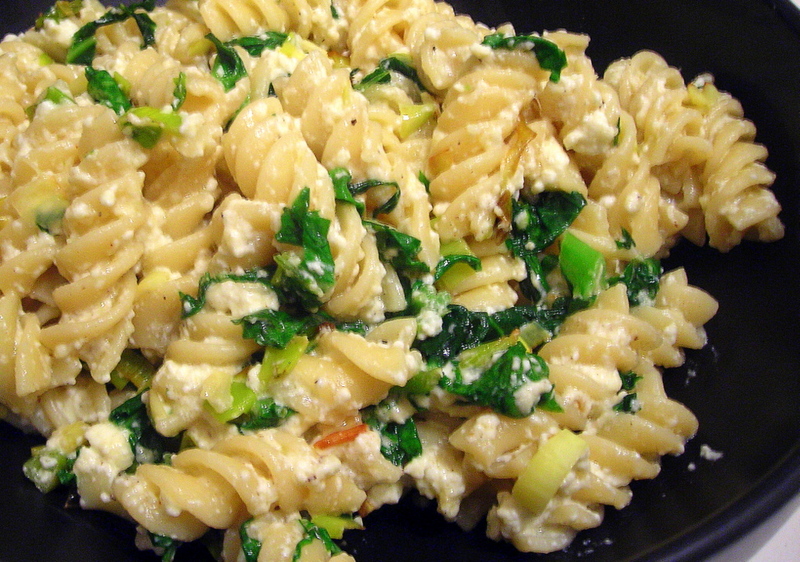 Combine pasta, leek mixture and ricotta. Toss. Check seasoning. Stir in Parmesan and serve immediately. This recipe is best made at the last minute. Have all ingredients at the ready once the pasta has been cooked. Time: 15 minutes, including prep. 02 Apr	This entry was published on April 2, 2010 at 3:33 am. It’s filed under food, general, spring, Union Square Greenmarket, vegetarian, winter and tagged arugula, dinner, kale, leeks, pasta, quick and easy, seasonal and local, vegetarian. Bookmark the permalink. Follow any comments here with the RSS feed for this post.